Zerovalent iron (ZVI) is the most commonly used zerovalent metal (ZVM) for environmental remediation. ZVI is typically applied as a reductant and is capable of transforming (degrading) or sequestering a variety of contaminants found in groundwater and soil. ZVI is a reductant used in the treatment of organic and inorganic contaminants found in various environmental media, including groundwater and soil. ZVI has been shown to treat a wide variety of contaminants including chlorinated solvents, metals and metalloids, nitroaromatic compounds (including energetic compounds), nitrate, and certain dyes. ZVI may be applied in both ex situ and in situ applications. When applied in situ, it is one of many in situ chemical reduction (ISCR) approaches. Below, we present an overview of basic ZVI redox chemistry, types of ZVI, applications, and contaminant treatment examples. In addition to oxygen and water, other oxidants, including certain contaminants, may also participate in redox reactions with ZVI. These reactions may result in the transformation (degradation) or immobilization of contaminants (see Contaminants Treated section below). The oxidation of ZVI also leads to the formation of various iron oxide species on the surface of the material, which can potentially adsorb contaminants (e.g., metal cations like Zn2+). Granular ZVI. Granular ZVI is used in remediation applications and is typically construction- or industrial-grade material. Sources of granular ZVI include scrap iron (e.g., from the manufacture of automotive parts), which is milled down and sorted to specific grain sizes, as well as direct production of granular material from molten iron. Nano-scale ZVI (nZVI). Nano-scale ZVI is typically defined as ZVI particles with a diameter of 1 to 100 nanometers. nZVI typically has a greater reactivity than granular ZVI per mass of material. This is attributed to larger overall surface area of the nZVI particles. Bimetallic nZVI. ZVI-based bimetallic particles are composed of ZVI with a second zerovalent metal deposited on the particle surface. Bimetallic particles of ZVI doped with palladium, platinum, nickel, silver, or copper have increased reactivity toward a number of contaminants when compared to ZVI alone. Combination products. ZVI and nZVI are often combined with other amendments to capitalize on other remediation processes such as in situ bioremediation and sorption. For combined ZVI treatment and in situ bioremediation, biostimulants (carbon sources) are often combined with ZVI. ZVI has also been combined with granular activated carbon with the intention of promoting reduction of sorbed contaminants. Several commercial formulations are available for both combined approaches. 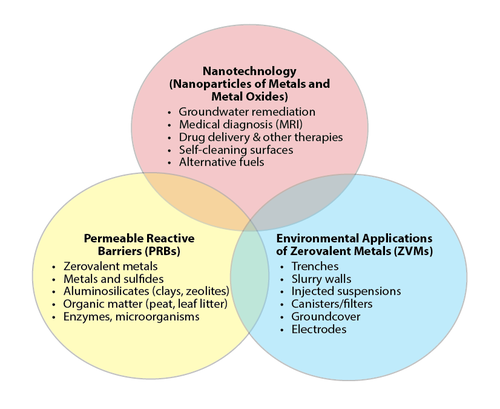 Properties and reactivity of these various forms of ZVI can vary due to the presence of “impurities” (inherent or intentionally-added) in the materials; because of this, ZVI products that fall into the same category described above may behave differently in remediation applications. Systematic research into the effects of impurities is limited. Transformation. Transformation processes involve chemical reactions that convert a contaminant to distinct products. Sequestration. Sequestration processes do not involve contaminant degradation, but instead primarily involve adsorption, reduction, and co-precipitation. Heavy metals and metalloids. ZVI has been applied to treatment of arsenic and heavy metal species including chromium, lead, copper, zinc, and uranium species. The process by which these contaminants are treated can generally be categorized as a sequestration process. Sequestration of these contaminants typically involves an often complex set of processes, which may include adsorption, redox reactions, co-precipitation, and precipitation. These processes result in reduced mobility of the contaminants. One common heavy metal contaminant treated with ZVI is hexavalent chromium (Cr(VI)). Cr(VI) is highly toxic and mobile. The sequestration process involves reduction of Cr(VI) to Cr(III) followed by Cr(III) immobilization through precipitation as Cr(OH)3 or incorporation into an iron (hydr)oxide shell on the ZVI surface . There are interconnected relationships between environmental applications of ZVMs such as ZVI and other established and emerging environmental technologies (Fig. 1). For example, ZVI was first popularized for environmental remediation because of the overlap of ZVM with PRBs. ZVI-based PRBs are now a well-established technology and applications are numerous. However, not all applications of ZVMs are PRBs, just as not all PRBs are constructed with ZVMs (Fig. 1). There is also overlap of ZVM with the growing and diverse field of nanotechnology, including the use of nZVI. Current ZVI research focuses primarily on nZVI, particularly its synthesis, modification, enhancement, and migration in environmental media. Other areas of current and future ZVI research include examining the influence of sources and impurities on reactivity, the use of combination products, and prospects for treating emerging contaminants. Figure 1. Overlap between areas of environmental technology related to ZVMs such as ZVI (reprinted with permission from Tratnyek et al. 2010.